Camp for €18,- a night at Campsite Le Clos Ste Thérèse in low season with CampingCard ACSI. 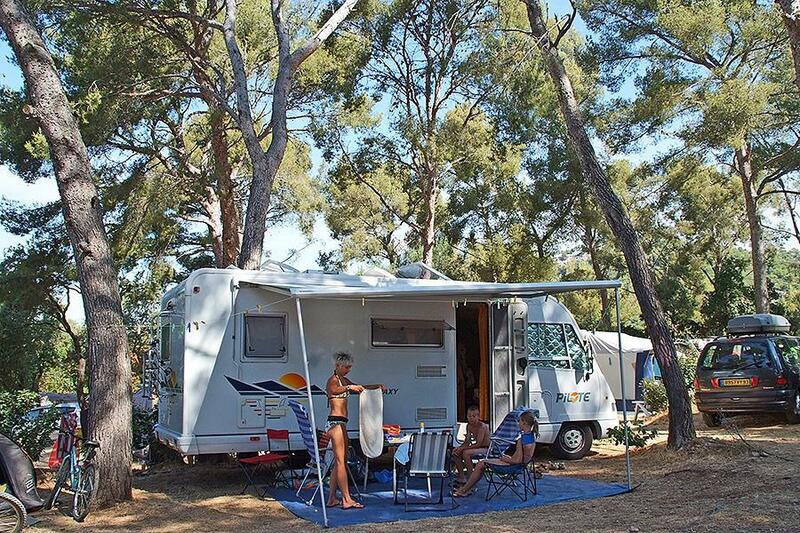 Campsite Le Clos Ste Thérèse, located in Saint-Cyr-sur-Mer (Var), is a campsite with 84 touring pitches and 3 year round pitches. With your CampingCard ACSI you can camp on one of the pitches during the following periods: 05-04-2019 - 05-07-2019 and 25-08-2019 - 29-09-2019. At this campsite you can not only use your CampingCard ACSI for inexpensive camping, you can also use your ACSI Club ID (as an alternative ID). A small, well-shaded family campsite protruding high above the sea and the Gulf of Frégate. 4 km from a sandy beach. Two swimming pools, one of which is heated. 15 km from the medieval village of Castellet and 25 km from Cassis and its magnificent bays. Stayed 3 nights, owner very helpful in trying to find beaches that are dog friendly. Shower & toilet facilities very limited in number. Only cold water for washing up and hand washing laundry. Right on very busy coast road which is noisy for 22hrs a day. So light sleepers beware! We stayed here for 12 days in 2012 in September, very relaxed, clean facilities and not crowded. Be prepared with ANT powder, and then not a problem. Ideal for access to sea and coastal walks. Friendly staff, very relaxed, speaks English. Would you like to book Campsite Le Clos Ste Thérèse or request more information? You can do both using the information below or by visiting the campsite's website. Follow A50 as far as St. Cyr-sur-Mer exit, then continue towards Bandol. Campsite is located 3.5 km from the village, on the left. CampingCard ACSI will send your information request to "Campsite Le Clos Ste Thérèse".